Using these 5 Tips for Keeping Your Healthy Eating Resolutions and Goals can help keep you out of the rut of waiting for tomorrow or to start next week. You know what I’m talking about, right? I know I’ve used the excuse of starting to eat healthy after one last weekend of pigging out on junk food far more times than I care to admit! Even though almost half the year is over (can you believe it?!) I think a lot of us make resolutions and goals year round for weight loss and healthier eating. As I sit here writing this while popping Cheetos into my mouth from lunch that I was craving, I feel like a bit of a hypocrite. However, I then remember it was part of my plan of 5 tips to keep your healthy eating resolutions and goals because I took less than a serving and then put the bag away! 1. Don’t deny yourself. This tip goes hand and hand with the second tip! We all have cravings now and then for things that aren’t quite so good for us whether it’s Cheetos or chocolate cake, etc. I find it is always best to not deny myself – if I do I’ll just end up gorging after I can’t stand it anymore and then feel even worse – both physically and about myself. This usually then opened the excuse for me that I’ve ruined my healthy eating habits for the day so why care what I eat the rest of the day. Sound familiar? I’ve found the trick is to have reasonable portions ala tip #2. 2. Measure your food honestly. I always smile when I remember a friend telling me that some weight loss programs hadn’t worked for her because she knew she cheated when she really packed the ice cream into that 1/2 cup measure. This isn’t brown sugar, folks! ;) It’s super easy to go over on the portion size, so I always like to measure to be more exact. Remember to spoon items into measuring cups and not pack them down. For items that can be more easily weighed, I love my new digital kitchen scale from EatSmart. And if you’re wondering, yes, you really do get used to not eating as much and being satisfied with a real serving. It still amazes me when I go to a buffet or make one of my favorite meals and remember how much I could eat before and now my stomach just can’t handle it! 3. Make small obtainable goals. One thing I haven’t really gone into much before as it is a subject that is still hard for me to talk about is that I once weighed in at nearly 400 lbs due to some issues in my life that led to a lot of stress and emotional eating. If I had started my weight loss journey with the mind set that I really wanted to lose at least 250 lbs – over half my weight (yikes!) – I probably would have failed before I even started. Instead I started with small goals like losing at least 2-3 lbs a week or being able to walk up a few flight of stairs without losing my breath and have continued to build upon those as I get healthier. 4. Regularly try healthier options. Other than sticking to healthy portions, another way I am able to eat the types of foods and dishes I really love is to regularly try healthier options. For example, if your family really loves spaghetti with meatballs a few times a month, why not try spaghetti squash or zucchini strip pasta or make your meatballs with turkey instead of beef and pork? Another is that for the Super Bowl we always have wings and I wanted to make my favorite recipe which usually involves breading and frying in butter. To make them a bit healthier, I instead opted to skip the breading and frying and just baked them. Turns out that we liked them even better this way! See my 10 Healthy Food Choices and Alternatives for more ideas. 5. Reward yourself positively. Growing up rewards were often given in the forms of food like candy or a special calorie-laden dinner or celebration – something often found in the south. It’s taken a lot of hard work and is still an on going process, but I try to instead now reward myself positively. If I lose 20 lbs, I reward myself with a new (and smaller!) t-shirt to feel even better and show myself it’s worth it. If I close a nice money-making deal I’ll buy a resource for the website or a gadget I’ve been eyeing instead of splurging on a steak dinner. Be sure to check out our other healthy living posts and let us know what are some of your tricks for staying with your resolutions and goals? 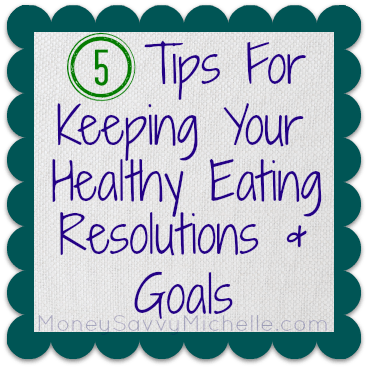 I hope you found these 5 Tips for Keeping Your Healthy Eating Resolutions and Goals useful! Thank you for the great tips. I need to keep these in mind for sure.